Is it just me or just the word Optimization tells us to really use our eyes, OPTI, EYES. So therefore we should use more PICTURES. Shun, means to avoid. How about avoid just reading the problem. Don't just read it, do more with it. Today’s class we started off with going over questions from homework. Exercises 5.4: 1-9. The problems Mr. K went over were #4, #5, and #9. Hope no one else had any problems with the homework. 1) Remember your geometric formulas. 2) Math is the science of patterns. Always look for patterns. 3) If you ever get stuck with your geometric figure, it’s never wrong to just drop a Cartesian plane, it might even help you see something you didn’t see before. After going over the three questions from homework. Mr. K put up three optimization problems on the board. The first one being the classic optimization problem. 1) A sheet of cardboard 3 ft by 4 ft will be made into a box by cutting equal size square from each corner and folding up the edges. 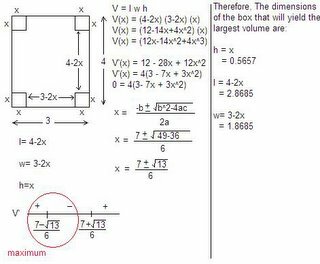 What will be the dimensions of the box with largest volume? In each optimization problem, there will be constraint equation we will be working with. The classic optimization problem up there, the constraints were the dimensions of the box and what they did with it (cutting equal size square from each corner). Some will give you a function as a constraint. Read the problems carefully. Write down what is given to you and draw a picture to understand of what is being asked of you to find. For homework today is the rest of 5.4: 9-18. Hope everyone does ok with the rest of the problems. A cylindrical can is to hold 20 pi meters cubed. The material for the top and bottom costs $10 per meter square and material for the side costs $8 per meter square. Find the radius and height of the most economic can. Sarah that was an absolutely spectacular scribe post! I particularly liked the play on words at the begining -- how we should really use our eyes when solving these problems. Fantastic! Bravo! !